A very rare and interesting oak sink / officer's ablutions cupboard unit from the old RAF training centre Netheravon, near Salisbury. This was the first training centre after the RAF was established. The unit is believed to date to 1920-30 and the ceramic sink has a beautiful Art Nouveau design, typical of the era. The sink is set in to a chunky, well made, oak cabinet with lid and cupboard door. The cupboard has an attractive brass coloured handle. The back of the cabinet has a faint pencil mark stating "Netheravon", making reference to the RAF training centre. We believe the sink would have been used in the quarters of a Junior Officer. The sink has very pretty, Art Nouveau, shell design soap holders and a painted RAF motif. 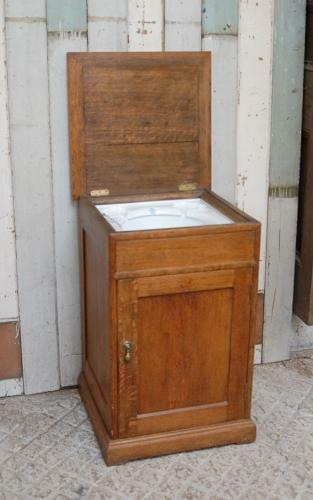 The sink was designed to be filled with water from a jug and used for washing. The sink has a waste pipe within the cupboard and could be plumbed in by purchaser. The sink is ideal for a shepherds hut or camping hut. The sink does have a "Made in England" stamp underneath, which has been photographed and can be seen faintly in the picture. This dating stamp was mainly used after 1921. The sink is in very good condition and is fully useable. There are some slight knocks and scratches to the oak due to age. The oak planks have some slight shrinkage, especially to the lid, but does not affect the structural integrity of the item. Very slight stains in the sink and some light cracks to the enamel glaze. The sink is a fantastic reference to RAF history and a must for any RAF collectors. The sink is very attractive and would look stunning in a shepherds or camping hut.